Fall 2012 Welcome Day offers information about campus clubs, services and social events. 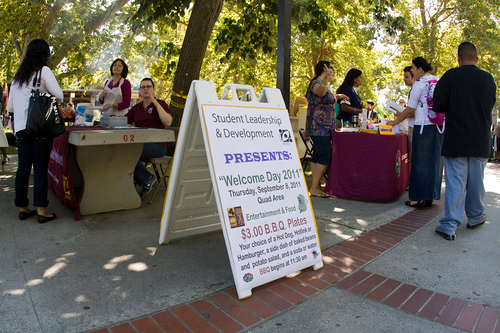 A photograph from Welcome Day Fall 2011 shows students gathered around a sign with an invitation to buy barbecue. Photo by Evan E. Duran. City College Student Leadership and Development will present Welcome Day on Thursday, Sept. 13, which will include barbecues in the quad noon to 1 p.m. and another from 5-6 p.m.
City College services, activities and clubs will be highlighted at this event, as well. There will also be musical entertainment provided during the barbecue lunch and dinner. Departments and programs will set up information tables throughout the quad, which will be staffed with people ready to explain and answer questions about City College offerings. “It’s a campus community event,” said Chris Torres, Student Leadership and Development student affairs specialist. The event is free. For the barbecue plate, hot dogs, hamburgers, sides and a drink will be offered. Students will need to present a valid student ID card as well as pay a $3 fee if they wish to eat. More information on the event is available from the Student Leadership and Department in SOG room 226 or by contacting Chris Torres at torresc1@scc.losrios.edu or (916) 558-2382. Additional reporting by Marlicia Coleman. This entry was posted in News, Sac City Express (SCC) and tagged campus, Chris Torres, City College, Leadership and Development, Marlecia Coleman, Quad, sacramento, Welcome Day. Bookmark the permalink.